Reconversion project of Oblivion to Skyrim. Type in game's console "cow tes4tamriel 5 10" to travel to Waterfront in Imperial City. "tmm 1" will show all map markers. If you want to know more about conversion, read this thread. If you wish to work with Skyblivion in Creation kit, you'll need a stripped Skyrim.esm master (because Skyblivion is bigger than Skyrim and CK can't load them both in memory at the same time). Use tesvsnip utility and remove CELL and WRLD groups from Skyrim.esm. Don't forget to restore the original one back when playing, or game will crash. Looks great so far but there is no way to make the lod work:/ even by unpacking the bsa (I think you've forgotten the "lodsettings" folder). Thank you so much for your work anyway, I'll start to work on grass when I can ; ). awesome work ;) Does this have the quests and dialogues ? If not, since I read you don't have a lot of time at the moment, would you care to share the tes5edit scripts you used for dialogues and scripts in Skywind ? Updated first post with a new link of updated archive, I forgot to include one file. Didn't I already post a link to scripts earlier in skywind thread? I don't remember. Landscape still needs some love though. Zilav: Yeah, you did.... maybe?, but those were the skywind scripts. Have you changed anything? Anyway looks great! I'm sure we'll get some people who will want to work on it. Also, do you think you could share the scripts you used to add clothing and such? Those could be useful for Skywind. 7) set starting formid for dialog branches in After DIAL script, should be a free space in oblivion.esm range to not overlap with everything. I think something like $01400000, need to check in tes4edit. I installed following your instructions and that worked perfectly ;) Thanks a ton for your work ! Just got an idea about objects LOD. Can someone who is familiar with CK set "IsFullLod" flag on IC, towns, ruins, bridges etc and make it an optional addon plugin. Yes it will probably stress engine, but way easier and faster than making lowpoly lod objects for everything and objects textures atlas. We don't need to create _far.nif, they are already in the skyblivion meshes ; ). We just need someone to generate it (and if you want even more lod meshes, you still have AEVWD on oblivion nexus). Are you sure they were properly converted over? As far as I know there is an issue with lod meshes and "translation" in nifscope (saw a post in USKP official forum page some time ago). You need a tree atlas for that, GKB wants to release it with the next version for his trees, so need to wait. Allright I'll start to replace some trees until then, still hope that SB will release some of his converted trees though. I'd prefer to have original trees converted. GKB's ones are great, but not sure that they'll look in place in Skyblivion. Of course, none of the trees we have can look as lush as the original trees. 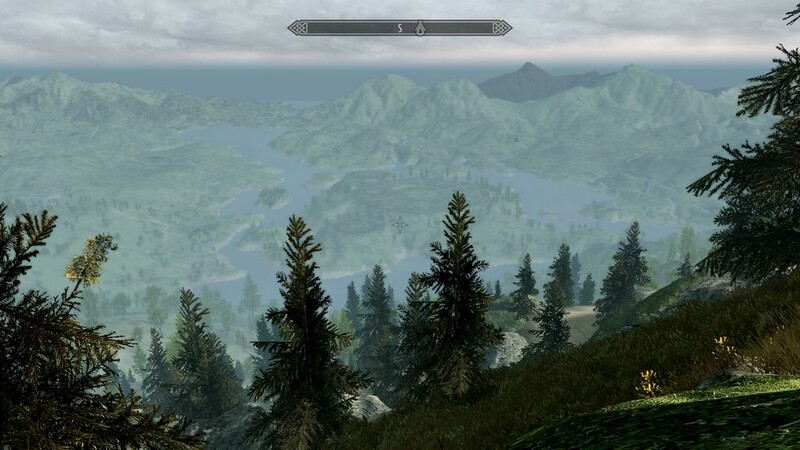 I hope there is a solution to have billboard trees in skyrim or it won't feel the same (or it will take a lot of polygons to have the same render with skyrim font trees). Did you see what I said about the Imperial city LOD? If it's a simple process I could try and add it myself really quickly. Is it easy to add a lod mesh? Edit: Hey Zilav, I'm not sure if I just did something wrong on my end, but.... the books don't seem to have any text? Other than that everything looks awesome so far. assuming i deleted/ copied everything into the right folder (of which i´m pretty sure...) - what could be my mistake, because i got every time a ctd after the loading screen when trying to cow to cyrodiil (and tried about 25 times, also with all other mods deactivated)? Text is there in master file, so some other issue (wrong mesh?). Hard to tell, either wrong install or mod conflicts. be deleting folders i traced it down to ".../meshes/tes4/dungeons/fortruins/exterior/castle"
Yes meshes are badly converted and crash in different places on different systems. Nothing I can do here myself. so this isn´t a general bugfixing-problem? if anyone wants to look after it i could try to figure out which file(s) are "bad"? I think that to solve a problem with books you need to replace in all books "<FONT face=5>" to "<FONT face='$HandwrittenFont'>" and "<font face=1>" to "<font face='$SkyrimBooks'>". But I'm not sure. Also you maybe need to convert all books images from .dds to .png. Try to update one book in TES5Edit and check in game. If it works, I'll write a script to batch update all books. Yes, it works. Also you need to close these tags at the end of a book (</font>). There are some other fonts (2-4), but I'm not sure, where game uses them, and the main fonts are only 1 and 5. Also, there are some problems with formating (I assume its because of a lot of <br> tags). There are no cities or buildings... just the land and guards, barrels etc. What have I done wrong? Installed meshes in the wrong folder. nevermind got it to work! honeslty i think oblivion's lighting was over the top. i like skyblivion right now... maybe with a very slight saturation boost but not a lot more. or even a small contrast boost, again very small. HHey I don't play games on pc but liked oblivion on Xbox 360. I was wondering if anyone is going to making skywind and skyblivion for Xbox 360 because that would be awesome and I won't end up playing these if they are on pc. Nope. Pc only. It's made for pc. I'm not even sure the xbox has the specs to run it. Not to mention you would have to hack the console to install it. There are only barrels and guards and land is purple. Got it to Work Thank You! I believe that most crashes are caused by broken nifs now. You'll just have to wait a bit until someone fixes them. First i just want to say, everything you guys have worked on is seriously amazing, and i really look forward to seeing improvements!! I am having a bit of trouble figuring out why the command cow tes4tamriel 5 10 is not porting me to the waterfront. it gives me an error outputting " item 'tes4tamriel' not found for paramter WorldSpace, perhaps i have installed something wrong? any help is nice. thanks. edit: well i got it figured out. silly me thought i could install the Skyblivion Reborn package w/o wyre bash. i was wrong, haha. You did something wrong when installing. It can be installed manually, that's how I did it. mod for traveling back and forth between skyrim and cyrodill? (oh and on a completely unrelated note, I have both skywind and skyblivion installed on the same copy of skyrim and they work well together so yeah they are completely compatible with each other as far as i can see, and both run full speed no lag or anything such as load time increase! at least for me... thought i'd let you guys know in case any of you were wondering and didn't know already.) thanks for the amazing work guys and keep it up!!! If you get permission, you could change the pale pass mod so the "door" links to the one in the new Cyrodiil, you just have to make a target door in Cyrodiil and remove the original one from the mod. could you make a video on how to do that on youtube? 1 Download and install the original Skyblivion and the Pale Pass mod, and get the cell coordinates for the "door" in Cyrodiil and also the one in Skyrim. 2 Remove the original Skyblivion and install the Reborn version. Then make a plugin with doors in the correct cells and link them. Remember to add map markers on both sides so you can fast travel. From there you can also add roads later on.